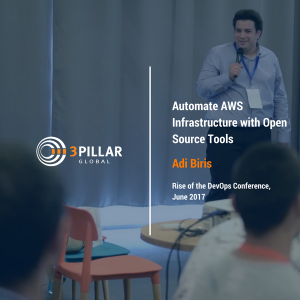 On June 10th, Adi Biris spoke at the Rise of the DevOps conference in Cluj-Napoca, Romania. Rise of the DevOps is a conference aimed at the growth of the DevOps community in Romania. It was hosted by 3Pillar Global at the Impact Hub, Cluj-Napoca on June 10th, 2017. In the presentation, titled “Automate AWS Infrastructure with Open Source Tools,” Adi gave us an introduction to three open source tools and went on to explain why we need them to automate our Amazon Web Services infrastructure. He started by explaining why we need Infrastructure as Code, moving on to the open source tools Packer, Terraform and Ansible and how we can use them for AWS infrastructure automation. At the end of the presentation, a brief Q&A session was held. For the past five years, Adi has been one of the DevOps/SRE working at 3Pillar Global. His career has taken him through different working environments, ISP, corporate and software development. His main focus now is cloud infrastructure, particularly AWS.